During school... both, when I homeschooled and now that three out of four are in public school, I have kept fresh fruit in a bowl on the table and in the refrigerator. I also keep things such as carrots and celery cut up and ready to pack. If I have to cut apples up for packing I will soak them in lemon water and then strain and pack them and add just a touch of the lemon water for transport and it keeps apples and pears nicely until lunchtime. If my children take apples they often want peanut butter or some kind of dipping sauce. I will sometimes cut up cheese cubes or slices to go with the fruit, too. My children are big cheese and fruit consumers. LOL Try a variety of cheeses. I cut them about the size of dice. Six cubes is a serving. I cut cheddar, monterrey jack, colby/jack, pepper/jack and mozzarella for them. It is often cheaper to buy the big block at Sam's or Costco and cut it yourself. It doesn't take that much more time and there are no fillers in the block cheeses like there are in the prepackaged precut stuff. Costco has great fruit in spring and right through late summer and early fall. I can find things like plums, strawberries, blueberries, melons, celery, carrots, pears, apples, peaches, grapes and broccoli. These are great snacking items and so easy to wash, prepare and pack. If crackers are your thing... there are some really cool gourmet style crackers offered for sale at Costco and Sam's but maybe you can find them on your grocery aisle in smaller amounts. I, honestly, love the big box with my big family and the variety is great... not to mention the different shapes for my younger ones. Very fun food! I truly believe that raw foods are a great source of nutrition and I encourage my children to eat lots. We do not drink juice or send those juice boxes when they can have water and fresh fruits. They get a juice at breakfast a few times a week and they really do not need more. Juice can often be empty calories and have sugar and corn syrup added. We don't really need all of that so we skip it. I have been known, however, to send an almond or rice milk with them for a special treat for after they drink their water. They sell them in little travel boxes now that can stay at room temperature. My children are meat eaters but there are certain vegetarian items they really enjoy. They are fans of hummus and I have used a variety of different beans with much success. The favorite is still the garbanzo bean hummus but black bean hummus is a close second. Olive Oil - drizzle until smooth consistency to finish. You might check out this great link for Bento Boxes or create your own versions with little Rubbermaid or other plasticware from places like Walmart, Walgreens, local grocery stores, Dollar Tree or other dollar stores or discount places. You might even find used stuff in good condition at thrift stores such as Goodwill or Savers in your area. Just stay away from obvious microwave damage and staining or questionable use marks. I have also invested in a small collection of glass containers with lids for refrigerator storage. Anchor Hocking has some nice stuff as do Corningware and Pyrex. More ideas coming... stay tuned! 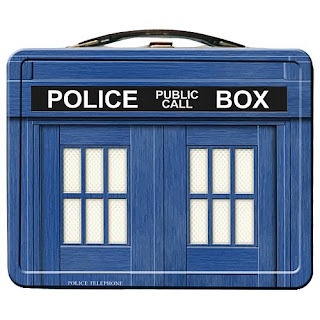 I am getting the Doctor Who lunch box for Kevin! We are Doctor Who fanatics!